Today, adventure and travel enthusiasts are buzzing about Belize. This Caribbean getaway is now a major tourist and relocation destination hotspot. One location that has benefited from this increased flow of travelers is Belize City. As the country's only major urban location and home to Belize's international airport, this metropolis exudes color, history and an array of diverse cultures. It's also the link to many of Belize's natural and historical cultural wonders, including the Cayo District. For ecotourists looking to explore all the natural and historical wonders of Belize, they can either take a short flight, travel by boat or take a bus to Cayo, the nation's largest district and home to Belmopan, the nation's capital. While visiting, tourists can delve into Mayan's mysterious archaeology found at the Belize Archaeology Museum. They can also hike through the Actun Tunichil Muknal caves and wonder at the formations that date back as far as 1,300 years and travel the paths to the Mountain Pine Ridge waterfalls. These adventures are only part of what this district has to offer. Out of six districts, exploring the highlights of Cayo is one of the more popular choices. For historical architecture lovers, Belize City is adorned with Caribbean and British colonial style homes, which speaks of the days when people knew Belize as British Honduras. Not to mention, the Altun Ha ruins, which date back thousands of years are enough to stir even the non-history buffs. 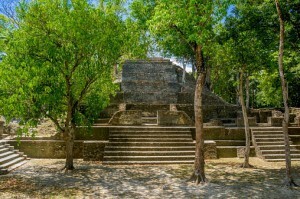 The 54-foot tall Temple of Masonry Altars, also referred to as the Sun God's Tomb, was occupied by the country's indigenous population for centuries. History buffs can spend hours debating the many artifacts researchers have uncovered from this historical wonder. To learn more, click here. One of Belize City's more popular and unique adventures includes cave tubing. For anyone who has tubed down a river, this is similar. However, people get to float through history as they explore Belize caves, which centuries ago was home to the Maya priests. From there, tubers of all ages can examine the lush and exotic Mayan Jungle scenery as they trek through its watery path. Belize City has many tour companies that offer various versions of this adventure. Regardless of tour guide choice during their cave tubing experience, adventurers will enjoy nature and history at its finest in an eco-friendly environment. Today, when people talk about taking trips abroad to enjoy nature, history and cultural wonders, Belize is now a top choice. The country brims with all of this and more. Belize City, although a metropolis, is a primary link to the country's wonders, including the large district of Cayo. So for those adventurers planning their next vacation, they may want to add Belize City to their bucket list.